Blue Ribbon Cookies delivered fresh to your doorstep. Imagine the expression on the faces of your loved ones as they bite into these wonderful offerings. Online Baked Goods Delivered right to your door. We handle all the details so you can focus on your fundraising ... easy fundraising ideas like this put the *fun* in fundraising! 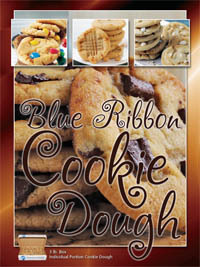 Earn BIG profits with Blue Ribbon Cookie Products. 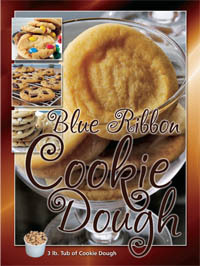 Everyone loves a great cookie, you can offer your customers the best with Blue Ribbon Home Delivered Cookie Dough. Online baked goods are available for the holidays! Home delivery service for gourmet cookie dough, too. Just ask us ... we deliver for you. The three pound products contain 48, 1 oz cookie dough. One of the most profitable fundraisers offered. Simply drop the cookie dough on cookie sheet and you're ready to bake. This is very popular for those who want the aroma and flavor of freshly baked cookies with zero hassles! Classic chocolate chunk, Cinnamon Oatmeal Raisin, Peanut Butter, Sugar Delight, Snicker doodle, Rainbow Chocolate Drop, Chocolate Chunk Pecan, White Chocolate Macadamia, Orange Cream, Oatmeal Cranberry, Double Chocolate Brownie. Product delivered to your organization’s door either in bulk or pre packaged to a seller’s order!! Vouchers Eliminate Bulky School/Student/Parent Distribution.